Harry is in trouble. 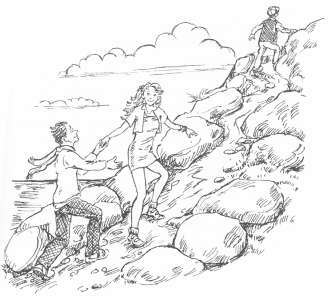 He's burned down the family kitchen so now he has to spend a week of his summer hols with his uncle Tristram - who's heading off to stay with his new girlfriend, Morning Glory, on a tiny British island. Harry doesn't expect it to be a lot of fun - with just a wacky competition at the end of the week to look forward to. He certainly didn't expect to discover all the beards. Or the angel on the mountain. Or the helicopters circling overhead all week. And he definitely didn't think it would be so wet. The ferry man did warn them, 'Glerhus Dill Sotblug!' But what on earth did it MEAN? And will they end up Eating Things on Sticks ... ? Harry, Uncle Tristram and the rest of the Mountfield family previously appeared in The More the Merrier . 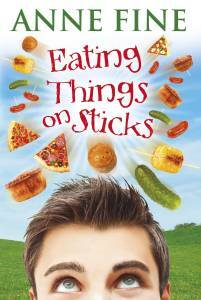 Eating Things on Sticks was shortlisted for the Roald Dahl Funny Prize 2009 in the 7-14 age category. The prize was founded in 2008 by Michael Rosen as part of his Children's Laureateship to honour those books that make children laugh. Illustration © Kate Aldous, 2009. Okay, I admit it. I missed them. I missed the whole family. After writing about their ghastly Christmas in The More the Merrier , I wanted them back. Harry, my (sort of) hero, and Uncle Tristram, whom we last saw throwing potatoes at the cat, set off in good spirits and with high hopes. But from the moment they fail to understand the ferryman's warning ("Glerhus Dill Sotblug!") things start to go awry. How could we manage without Titania, that little cream-puff with feet who spent the whole of Christmas showing off. ("Can I thing you my little thong? Can I danth my little danth for you?") Well, she's not here in person. But Harry does the very best imitation he can of her recital "It wath a dark and fearthome night." "This book is funny. This book is fun. This book put a stupid big grin on my face." " I laughed in every chapter of this book - definitely one for a rainy day." Eating Things on Sticks is a book for children in the middle age range. It was published by Doubleday on 2nd July 2009. Buy the original hardback edition from Amazon, or order it from your bookshop or local library (ISBN: 978-0-3856-1602-7). The paperpack edition was published by Yearling (imprint of Random House Children's Books) on 1st July 2010 (ISBN: 978-0-5525-5993-5); order the paperback from Amazon. or Download the Kindle eBook edition.